The Borough Primitive Methodist chapel in Canterbury was opened in 1876 and closed in 1936, soon after Methodist union. 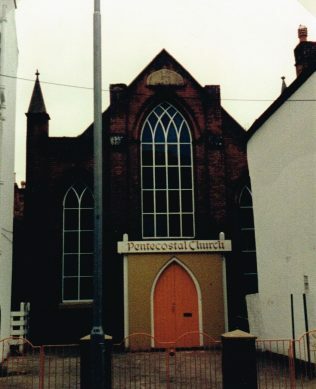 Keith Guyler’s notes which accompany his photograph say that it united with St Peter’s and was used as a youth centre. In 1969 (or possibly 1963; the writing is unclear) it was adopted by the Assemblies of God Pentecostal church. The Historic Canterbury website says that in 2007 it was no longer a church and was used by the King’s School. Prior to 1876, there was a chapel in St John’s Place, Northgate Street. When the new chapel was opened, the previous one was turned into one of the St. John’s Board Schools. The 1851 census of religious worship says attendance at the Primitive Methodist chapel was 88 in the morning, 93 in the afternoon and 100 in the evening.